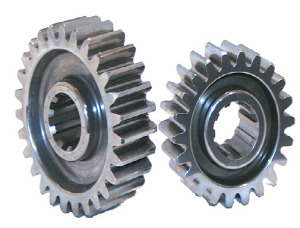 FROM ONE OF Americas #1 Engine Builders comes the Quick Change Gears for the Millennium! Made from the strongest material available, these B&J Pro Lite Gears are unbreakable, and that’s just the tip of the ice-berg. The series of machining processes and quality control steps are only found in the high tech aerospace programs. Bottom line is they fit the Spline perfectly to ensure zero run out. The Teeth are crown shaved in 3 different processes, in fact if you hold one Gear in each hand and rotate the meshing teeth together you can not feel them touch one another. This is true power saving performance. Secondly, put them in your car, you’ll feel the difference in how easily it rolls. Both Gears are lightened and that’s a plus for sure. Now think about all the advantages and then remember that this Gear will DROP your Rear End temperature 200! That means longer life for the entire assembly. This is a win! Win combo!! The price is higher than other Gears but your getting true value for your dollars. All the added effort in making this Americas #1 Sprint Car Gear, does cost more!